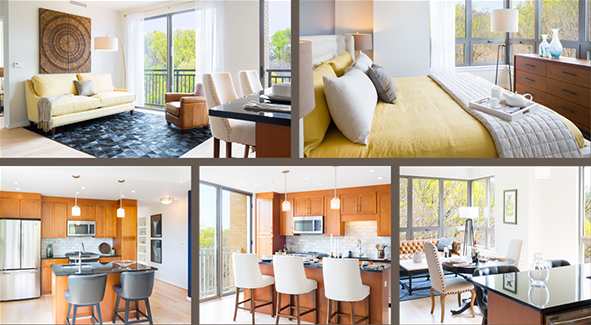 Park Van Ness features spacious 1 bedroom apartments with panoramic views of Rock Creek Park. Each apartment includes modern kitchens with brilliant black granite countertops. Stainless steel appliances and a custom backsplash add to the beautiful kitchens. The 1 bedroom apartments feature maple wood flooring throughout the entire apartment. Interested in learning more about Park Van Ness apartments? Residents at Park Van Ness enjoy an incredible rooftop pool and sun deck. Other upscale amenities include a terraced club room and spacious fitness center, which includes a private yoga studio for stretching and strength work. If you enjoy exercising outside, an outdoor workout space is also available. The ground floor of the property includes exciting retail like Soapstone Market and Sfoglina restaurant. A WiFi lounge is also available to building residents. Enjoy these features and more, located just steps from the Van Ness-UDC metro stop (red line) and Rock Creek Park. Loved that so many of the apartments had views of the park. They offer quiet and peaceful living but were just steps from great shops and restaurants. The units are all spacious with high ceilings and very high quality finishes.